This is a common condition which primarily affects sporty adolescents – up to 1 in 5. Boys are affected 3 times as often as girls, and the other knee may be affected in a quarter of cases. It is most common between 9 and 16 years, coming on earlier in girls. Sometimes it coincides with going through a growth spurt. Associated sports involve running, jumping and turning, so include football, rugby, netball, dancing etc. It presents as pain and tenderness in the region of the tibial tuberosity, the bony prominence at the front of the tibia (shin bone) just below the knee. It is often associated with a bump or swelling in that area. Early on there may be just pain, before a bump develops. The pain is worse with exercise, better with rest. It probably arises as a result of repetitive stresses, (overuse) where the patellar tendon inserts onto the tibial tuberosity. The tibial tuberosity forms as a separate piece of bone, called an apophysis. This condition is therefore a type of “apophysitis”, or inflammation of the apophysis, as the body tries to heal the area by creating new bone. The process can result in fragmentation of the tuberosity which shows as a separate, prominent piece of bone on x-rays. The natural history is for Osgood-Schlatter disease symptoms to resolve over a period of 1-2 years, leaving a variable enlargement of the bony prominence, which is permanent. Rest, ice and anti-inflammatory medication are useful measures early on to relieve the pain but there is no evidence that continuing with sporting activities does any long-term harm. Physiotherapy, with quadriceps stretching can decrease the pain. If the pain does not settle it is usually because of a mobile fragment of bone within the lower end of the patellar tendon. Occasionally, but rarely, this requires surgical removal in adulthood. Adults who have had Osgood-Schlatter disease as a child often have prominence of the tuberosity. This might cause symptoms in some jobs involving kneeling, but usually no other problems. “Tendinopathy” is a slightly different, more chronic progression, with degeneration of the deeper parts of the tendon. 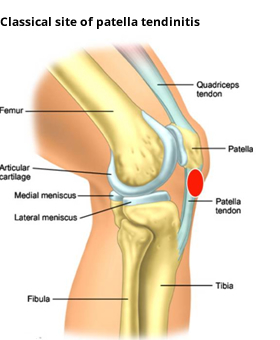 Patella tendinopathy generally effects those aged 30 or over. There is an overlap of the two conditions. The condition is improved by rest and made worse by running, jumping and other similar activities. The diagnosis is usually made on the basis of the history of the condition and clinical examination. Investigations may include ultrasound and/or MRI scan which will show abnormality in the top part of the tendon. An Xray may be normal, but in chronic cases can show a bony spur at the patella tip. It may be a self-limiting condition, which means that the condition will settle given time although sometimes this can take up to a few years. Treatment regimes are designed to speed up recovery or lessen symptoms whilst recovery is taking place. Early treatment includes activity modification, ice, anti-inflammatories physiotherapy. Physiotherapy has an important role, and the majority of patients will improve symptomatically especially with highly specific [eccentric type] exercises. Steroid injections into the tendon are not generally used because of the risk of further weakening, and even rupture- which can be disastrous. There are a few circumstances when steroid injections might be used around the tendon. So-called “dry needling” is an effort to stimulate healing by causing bleeding (by putting a sharp needle into the area), but success is variable and unpredictable. Injections, of autologous (your own) blood, or PRP (platelet rich plasma) have been advocated but the results are unconvincing. Another injection you might read about is “prolotherapy”- again, there is very little to suggest this is effective. When symptoms are severe enough and the diagnosis has been confirmed, and other treatments have failed, surgery can be undertaken. This involves debridement (removal of damaged tissue) of tendon either arthroscopically [by keyhole surgery], or with a small open procedure. Recovery can be 3-6 months before we know if it has been effective. A bursa is a lubricated sac of tissue which lies between two structures allowing them to glide easily over each other. 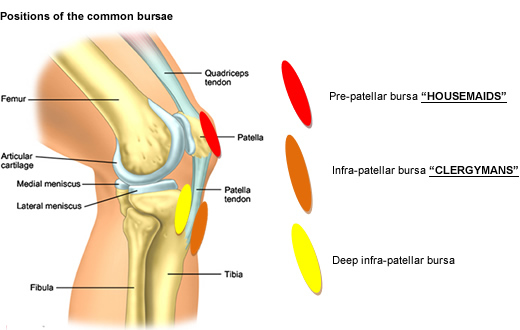 Around the knee, for example, there is one which lies between the kneecap and the skin (the pre-patellar bursa) – Right), and one which lies between the lower end of the patellar tendon, tibial tuberosity and the skin (the infra-patellar bursa) – Below. The bursa may become inflamed and irritated due to constant friction between the skin and underlying area. It may swell up with fluid, sometimes quite dramatically. This is particularly common in some professions involving kneeling (e.g. carpet layers, joiners, plumbers). 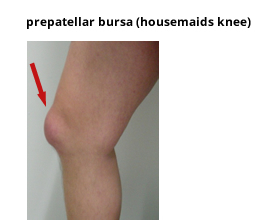 The common name for pre-patellar bursitis is housemaid’s knee, and for infrapatellar bursitis is clergyman’s knee. Other bursae which may become inflamed and include the semimembranosus bursa (at the back), and the “pes anserinus” bursa at the front. Avoidance of kneeling, rest, firm bandaging and anti-inflammatory tablets may all help. Cortisone injections are not generally recommended, but may settle down a very painful episode. However, there may be a risk of introducing infection. Surgery, in cases of persistent recurrent episodes which interfere with normal activities or work, is rarely required. If it is, it involves an open incision to remove the inflamed bursal tissue. A BAKERS CYST is a swelling in the back of the knee. It is also called a POPLITEAL CYST because the proper name for the soft area at the back of the knee is the popliteal fossa. A Bakers cyst can be very small, and only detectable with a scan, or very large and apparent as a firm lump up to several centimetres across. It is not dangerous but can be uncomfortable. The cause of a bakers cyst is an out-pouching of the normal knee lining becoming filled with fluid. The fluid is just an excessive amount of the normal fluid which lubricates the knee joint, called synovial fluid. Surgical removal of the cyst is potentially dangerous to nerves and blood vessels, has a high risk of recurrence and is unnecessary. Sometimes they disappear spontaneously, or burst causing pain in the calf which can be inflamed for a few days. This is not dangerous but is sometimes mistaken for a DVT (blood clot). Surgery to treat the cause of excess fluid, for example to treat a cartilage tear or arthritis, often gets rid of the bakers cyst. BAKERS CYSTS ARE NOT DANGEROUS! Sometimes called ITB syndrome or runners knee. The ilio-tibial band is the firm broad band of tissue which you may feel running down the lower part of the outer thigh towards the knee. With repetitive stresses and irritation between the ITB and the underlying structures, pain may be caused. The pain is usually made worse with certain vigorous activities, especially running. Activity modification, physiotherapy with ITB stretches and anti-inflammatories may all help. Sometimes a steroid injection in to the painful area is required. In resistant cases with a tight ITB, surgical release or lengthening through a small incision may be required. 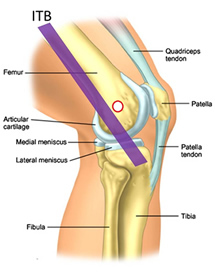 Right knee outer aspect: The ITB (purple) runs down the outer side of the thigh, towards the outer front aspect of the top of the tibia. You may be able to feel a bump of bone there. It is called “Gerdy’s tubercle. It rubs over the outer side of the femur (red circle) with repetitive activity, as the knee bends and straightens.